✔️ 2 pieces; actual size: Top: 14 inches' shoulder to hem, waist 24 inches. Skirt: 19 inches' waist to hem, waist 20 inches. 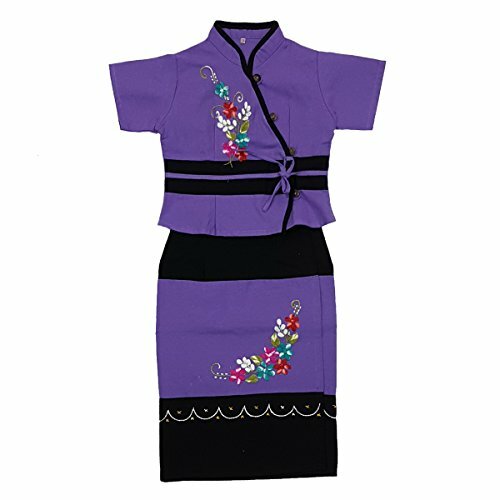 2 to 3 year ✔️ Color: Purple base with multicolored embroidery and black trimmings ✔️ Pattern: Embroidered pattern in red, pink, green, white, yellow ✔️ Material: Cotton base with cotton embroidery and trimmings ✔️ Style: Ethnic & Traditional Occasion: Perfect for costume and daily casual, party or functional wear. Imported from Thailand. Brand new and individually packaged. Care: When washing & caring for your clothes, use hand warm water below 30 ℃. Hand wash only, do not mix with other colors and do not use a washing machine. You can dry clean the clothes. Actual products may vary in color due to photographic lighting or your monitor setting. 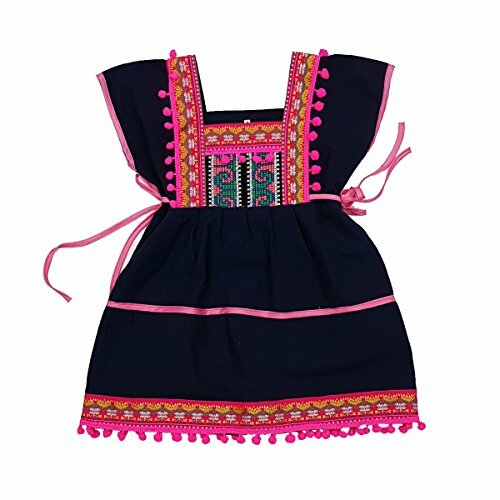 ✔️ Actual size: 21.5 inches shoulder to hem, waist 27 waist, 3 to 4-year-old ✔️ Color: Blue base with multicolored embroidery and pink trimmings ✔️ Pattern: Embroidered pattern in pink, green, blue, yellow, black, white ✔️ Material: Cotton base with synthetic and wool blend embroidery and trimmings ✔️ Style: Ethnic & Traditional Occasion: Perfect for costume and daily casual, party or functional wear. Imported from Thailand. Brand new and individually packaged. Care: When washing & caring for your clothes, use hand warm water below 30 ℃. Hand wash only, do not mix with other colors and do not use a washing machine. You can dry clean the clothes. Actual products may vary in color due to photographic lighting or your monitor setting. ✔️ 2 pieces; Actual size: Top: 15 inches' shoulder to hem, waist 26 inches. Skirt: 20 inches' waist to hem, waist 20 inches. 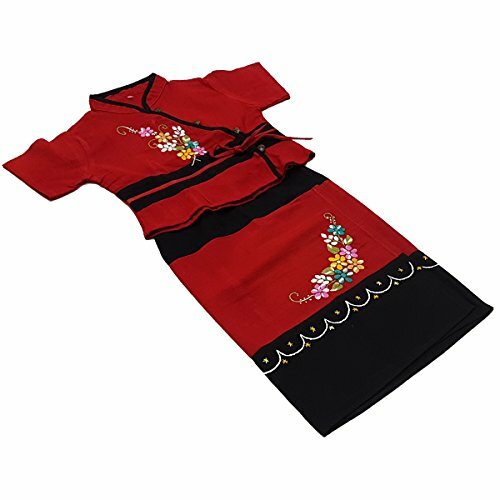 2 to 3 year ✔️ Color: Red base with multicolored embroidery and black trimmings ✔️ Pattern: Embroidered pattern in yellow, pink, green, white ✔️ Material: Cotton base with cotton embroidery and trimmings ✔️ Style: Ethnic & Traditional Occasion: Perfect for costume and daily casual, party or functional wear. Imported from Thailand. Brand new and individually packaged. Care: When washing & caring for your clothes, use hand warm water below 30 ℃. Hand wash only, do not mix with other colors and do not use a washing machine. You can dry clean the clothes. Actual products may vary in color due to photographic lighting or your monitor setting. ✔️ Actual size: 16.5 inches' shoulder to hem, waist 20 inches. 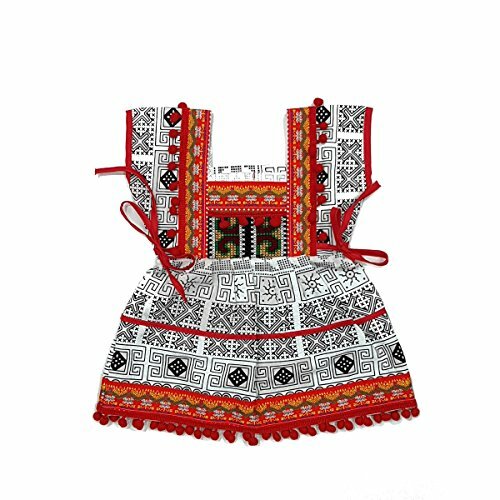 1 to 2 year ✔️ Color: White base with black printed pattern, multicolored embroidery and red trimmings ✔️ Pattern: Embroidered pattern in yellow, green, red, blue, black, white ✔️ Material: Cotton base with wool-blend and synthetic embroidery and trimmings ✔️ Style: Ethnic & Traditional Occasion: Perfect for costume and daily casual, party or functional wear. Imported from Thailand. Brand new and individually packaged. Care: When washing & caring for your clothes, use hand warm water below 30 ℃. Hand wash only, do not mix with other colors and do not use a washing machine. You can dry clean the clothes. Actual products may vary in color due to photographic lighting or your monitor setting. 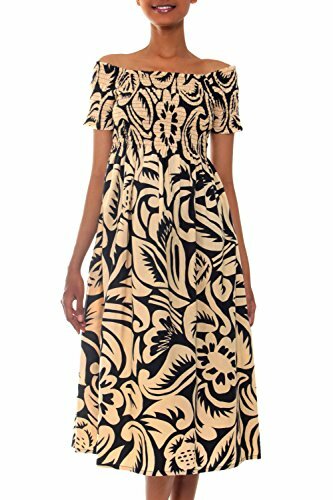 ✔️ Actual size: 19.5 inches shoulder to hem, waist 27 inches. 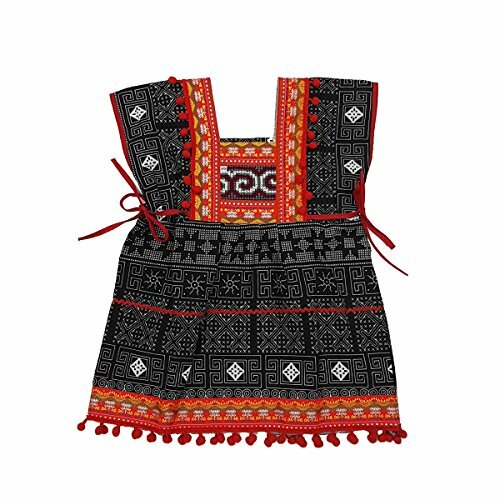 3 to 4-year-old ✔️ Color: Black base with white printed pattern, multicolored embroidery and red trimmings ✔️ Pattern: Embroidered pattern in yellow, green, red, blue, grey, black, white ✔️ Material: Cotton base with wool-blend and synthetic embroidery and trimmings ✔️ Style: Ethnic & Traditional Occasion: Perfect for costume and daily casual, party or functional wear. Imported from Thailand. Brand new and individually packaged. Care: When washing & caring for your clothes, use hand warm water below 30 ℃. Hand wash only, do not mix with other colors, and do not use a washing machine. You can dry clean the clothes. Actual products may vary in color due to photographic lighting or your monitor setting. ✔️ Actual size: 15 inches' shoulder to hem, waist 23 inches. 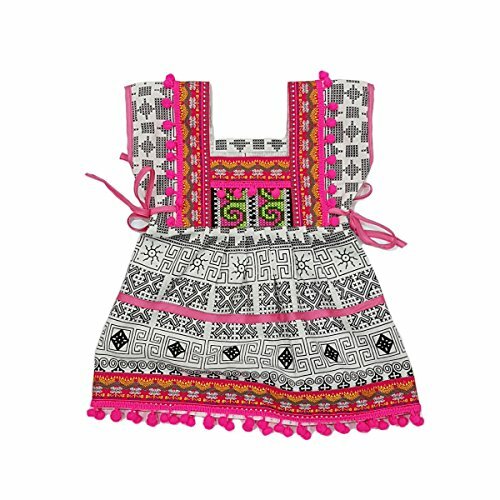 1 to 2 year ✔️ Color: White base with black printed pattern, multicolored embroidery and pink trimmings ✔️ Pattern: Embroidered pattern in yellow, pink, green, blue, white ✔️ Material: Cotton base with synthetic embroidery and cotton trimmings ✔️ Style: Ethnic & Traditional, Modern Occasion: Perfect for daily casual, party or functional wear. Imported from Thailand. Brand new and individually packaged. Care: When washing & caring for your clothes, use hand warm water below 30 ℃. Hand wash only, do not mix with other colors, and do not use a washing machine. You can dry clean the clothes. Actual products may vary in color due to photographic lighting or your monitor setting. Full Funk brand item, awesome designs with extra-awesome value.Measurements:- Given sizes are approximations only, exact measurements may vary.- Size tags sometimes do not match the advertised size.- To compare sizes take a similar item of your own that fits well and lay it flat, smooth it out and use a tape measure to measure straight across, making sure the tape measure is tight.- Bust covers the range of the wearers bust measurements we feel this dress is suitable for.- Shoulder is obtained by measuring once across and then doubling this measurement.- Length is from the highest point on the shoulder to the bottom hem.SmallBust: 26-34inches (66-86cms)Length (top of dress fabric to bottom hem): 40inches (102cms)Each straps length: 22inches (56cms)Fabric: Saloo CottonVery thin summer gauze cotton. Material can shrink and the colours may run, especially on the first few washes. ✔️ Actual size: 17.5 inches shoulder to hem, waist 20 inches. 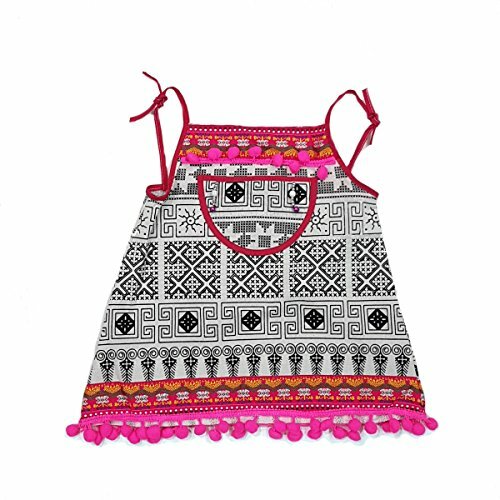 1 to 2 year ✔️ Color: White base with black printed pattern, multicolored embroidery and pink trimmings ✔️ Pattern: Embroidered pattern in pink, yellow, green, blue, black, white ✔️ Material: Cotton base with wool-blend and synthetic embroidery and trimmings ✔️ Style: Ethnic & Traditional Occasion: Perfect for costume and daily casual, party or functional wear. Imported from Thailand. Brand new and individually packaged. Care: When washing & caring for your clothes, use hand warm water below 30 ℃. Hand wash only, do not mix with other colors, and do not use a washing machine. You can dry clean the clothes. Actual products may vary in color due to photographic lighting or your monitor setting.